This is not too far from Kilnave where Andy's picture was taken. 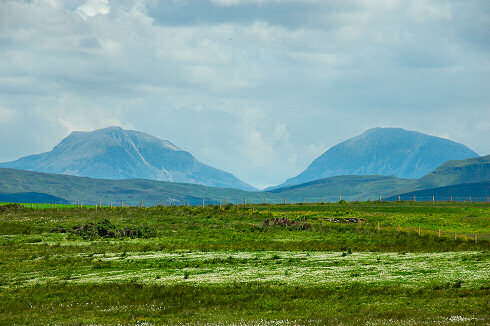 The view is in the same direction, as you can see the Paps of Jura in both. Mine is from Eilean Nòstaig just west of Ardnave, looking east. In a way it is a picture for my mother: She was quite impressed by the amount of cottongrass (Wollgras in German) you can see in a lot of places on Islay. The white you can see in the foreground is all cottongrass (I've got closer views of it as well, if anyone is interested in seeing a picture of it let me know in the comments and I'll post it).